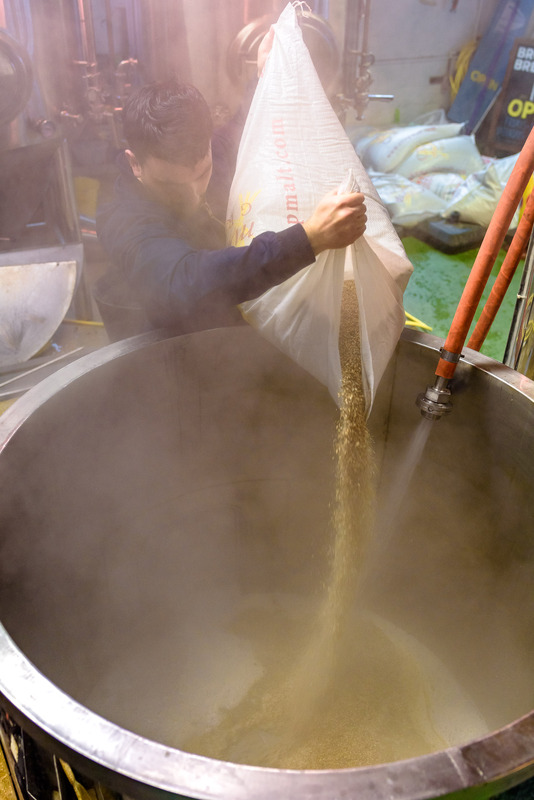 Moving on from the smaller proportions of the brew school mashing in, here was depicted a brewer pouring in a whole sack of grain and mixing it with water from a hose. This was in contrast to the brew school where a bucket of grain and a comparative trickle of water were mixed in together. This for me showed the more serious side to the brewery when the beer had begun to be made on a bigger scale. I thought the steam coming from the mixture added to this seriousness as it added atmosphere to the more hands on approach of the process. I chose a high viewpoint looking down to document this process as I felt it added drama as well as showing more clearly what was going on inside the canister. The inclusion of more sacks in the distance suggested just how much grain the brewer would be pouring in to the mix. Lastly, I felt I managed to capture quite a decisive moment by photographing the brewer in full flow as he made sure to mix the grain and the water together, making the process more obvious to the viewer. f/4, 1/200s, ISO 1400, focal length 35mm, handheld.